The Dust has settled. The smoke has cleared. The war machines of Greyhawk’s armies have ground to a halt. In the aftermath of the great war, the people of Oerik piece their lives together, some struggling to retain their homes, others pilgrimaging to the cities, searching for opportunities. And searching for answers. Who is in power ? Which borders still stand, and which have been dissolved ? Can anyone be trusted, or have Scarlet Brotherhood agents infiltrated every inn and tavern ? The lands of Greyhawk are forever changed, but provide more opportunities than ever for adventure and danger. Characters of all levels will find challenges and intrigue lurking in every alley and behind every tree. 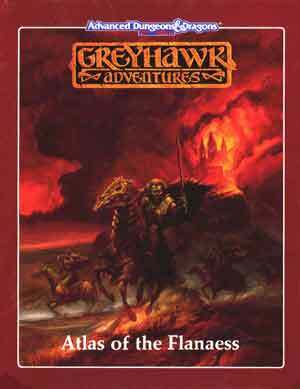 The purpose of this Campaign Book is to detail a local campaign setting within the world of Greyhawk, providing much more detail about a smaller area than is possible in the Atlas of the Flanaess. The area of focus is the expanded lands around the Free City of Greyhawk. A fully revised and updated guide for Oerth, the planet that is home to the world of Greyhawk. 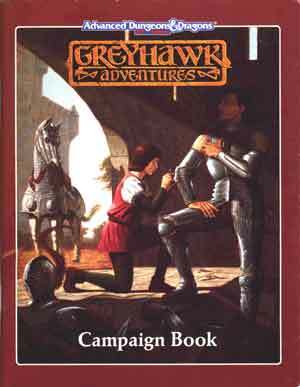 It supercedes the old World of Greyhawk boxed set, updating all important information from that product. 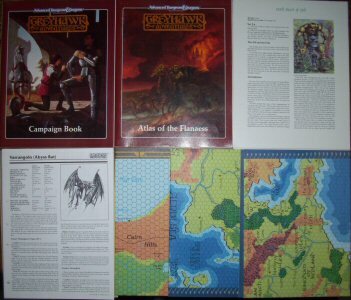 This boxed set includes three poster maps of the Greyhawk lands, five new monsters, twenty cardsheets, two 96-page booklets describing the recovering nations and the Powers of Greyhawk, and endless opportunities for adventure !